Running with music is a controversial one. There are lovers and haters. While some argue it’s a distraction from your A-game, research shows it can help improve performance by up to 15%. Music definitely improves our game – blocking out the complaints of achy muscles and helping to pick us up from those mid-run lows. But creating the perfect running playlist is an art. Despite spending hours putting together the perfect playlist we never get it quite right – inevitably ending up with something that’s more likely to hinder than help those final sprints. So how do you make sure your playlist will help your performance? Well, adidas have teamed up with Spotify to launch a new app which promises to solve all our problems. 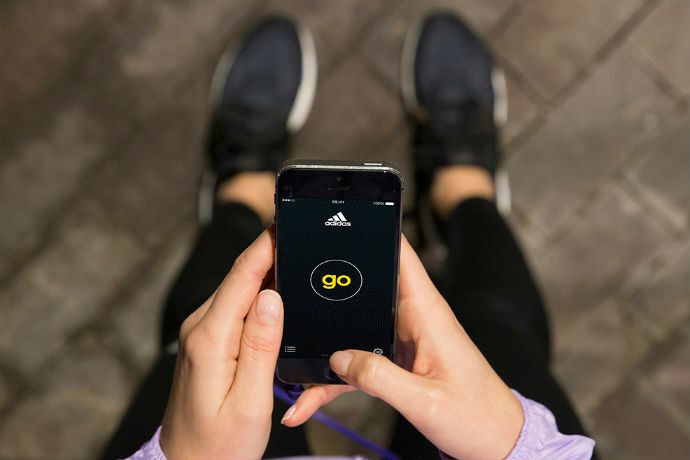 Called adidas Go, the app uses an iPhone’s accelerometer to match a runner’s favourite music to their workout. Using the stride rate, it automatically identifies tracks with matching beats per minute. It also allows runners to stream new tracks that Spotify thinks you might like, with a chance to review not only distance, pace, time and adidas miCoach Runscore, but also all the new tracks you might have heard during the training session. You can then share it on Twitter and Facebook. The app is available on iOS via the app store here. When opening the app for the first time you’ll get a 7-day Spotify premium trial (which you’ll need to store a local version of your music).